100% wild-caught Haddock char-grilled and expertly seasoned. It’s almost impossible for something that tastes this good to be this good for you. 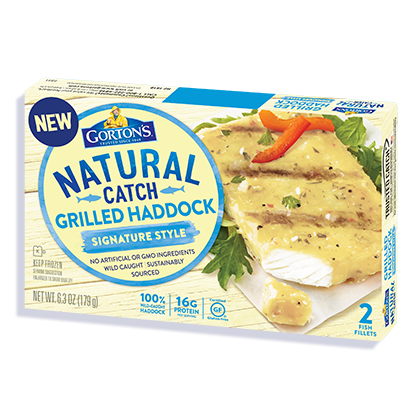 At just 70 calories and made with no artificial ingredients, these sustainably wild-caught Haddock fillets are full of both flavor and wholesome goodness. 2. Microwave 1 fillet on HIGH for 3.5 minutes*, or 2 fillets for 4.5 minutes*. For lower wattage microwaves, add additional 1 minute for one fillet and additional 2 minutes for two fillets to cook time. Water, canola oil, potato starch, sea salt, garlic powder, spices, dehydrated red bell pepper, paprika, onion powder, whey, parsley, natural flavor.